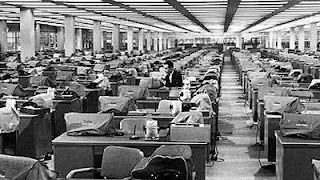 A modern office resembles the dark vision of Jean-Paul Sartre'. In his play "No Exit," he traps three characters in a room. The characters psychologically torment each other. The lights never dim and no one can escape. To Sartre', "hell is...other people," and they are impossible to escape.